Sadly Bangkok’s days as the “Venice of the East” are long gone, with most of the canal (or Khlong) transport routes that criss-crossed the city replaced by congested roads as an everyday means of transport. 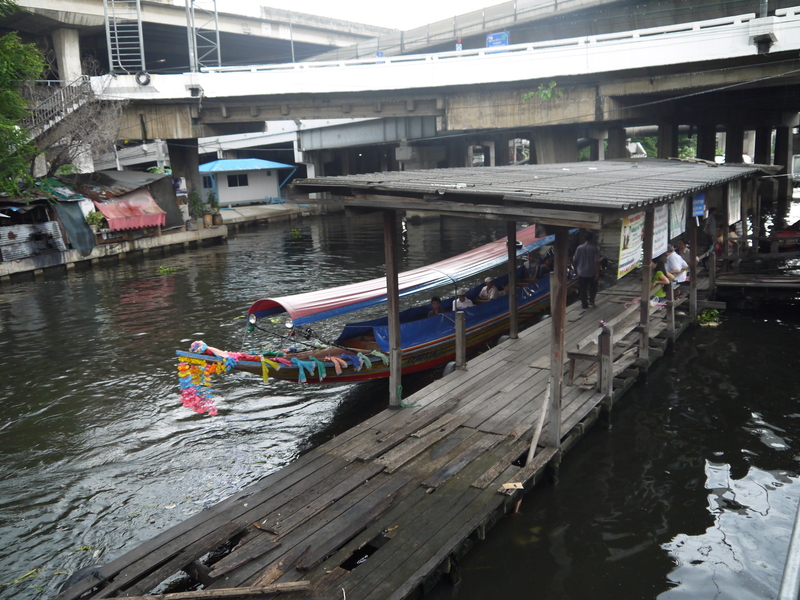 But even aside from the ferries that run up and down the Chao Phraya river, there are still some canal routes with public commuter boat services running, which can be a great way of seeing a different, older side of Bangkok. The Saen Saeb canal in fact is still very popular with commuters, being an alternative way of getting to and from the downtown shopping and working areas from out along Sukhumvit road and further east – with the canal running along Phetchaburi Road (think one “big block” north of Sukhumvit road and the skytrain). Catching a ride is as simple as waiting at one of the piers along the canal, with boats coming every 10-15 minutes or so in daylight hours. But for a quieter, more scenic trip through a local neighbourhood, we’ve found that the public ferry service along the Phra Khanong canal is an interesting way of spending an hour or so, running from close to the On Nut BTS Skytrain station, heading northeast to Thanon Sri Nagarindra – where, conveniently, there is an air-conditioned shopping mall nearby. A quieter river means that not only are you less likely to get face-splashed from another passing boat, but it also feels like the local side of Bangkok a bit more – passing quiet temples backing onto apartment buildings and with commuters being greeted by their pet dogs at the piers by their houses. And at around 20 baht for a trip it’s a small fraction of the cost of a more tourist-oriented canal tour. Although the main pier near the On Nut BTS Skytrain station is tucked away a bit, you can’t miss it by walking along Sukhumvit Road back towards Phra Khanong, crossing Thanon On Nut road and keeping on straight for another few hundred meters until you reach the canal. There’s a pedestrian bridge to cross with the pier on your left on the other side. Although we’ve read that the boats run every 20-30 minutes, our experience has been that boats seem to depart reliably on the hour up until 6pm or so when it gets dark (and except maybe at lunchtime), with late afternoon a good time to make the trip – both avoiding the heat of the day as well as it being nicer in the afternoon light. At the final Sri Nagarindra stop, it’s easy enough either to head straight back again or to catch a passing bus, sawngthaew or taxi south along the main road for a kilometer or so to the big Seacon Square shopping mall for a coffee/shopping break – these days arguably the other “real” Bangkok experience!